Germane Barnes is overseeing the development of an arts district in Opa-locka's Magnolia North neighborhood. This is an artistic rendering of the additions that will be added to homes in Magnolia North as part of the micro-enterprise project. This quadplex is being converted into an art gallery, which will be one of the area's public houses. The CDC owns this property, which is in the process of being renovated. This quadplex will one day house art. The city's Community Development Corporation is working to change the area's reputation by converting abandoned buildings into works of art and encouraging artists to move into the area. That sounds a little like what's happened in Wynwood, but the artist behind this project says the two developments have some stark differences. Germane Barnes moved to Opa-locka from Los Angeles to spearhead this effort about seven months ago. He says artists like himself are already starting to move to the area, so he understands when comparisons are made between Wynwood and the Opa-locka project. "I think it's very attractive because one of the things that attracts artists is cheap rent," said Barnes. "Because Opa-locka is completely untapped in a sense that a lot of its places are very large and very low rent, it does have a lot of potential to become a very, very, very vibrant location," said Barnes. But he says that's where the comparisons with Wynwood end. "One of the great distinctions is that we're trying to include the people who live there," said Barnes. 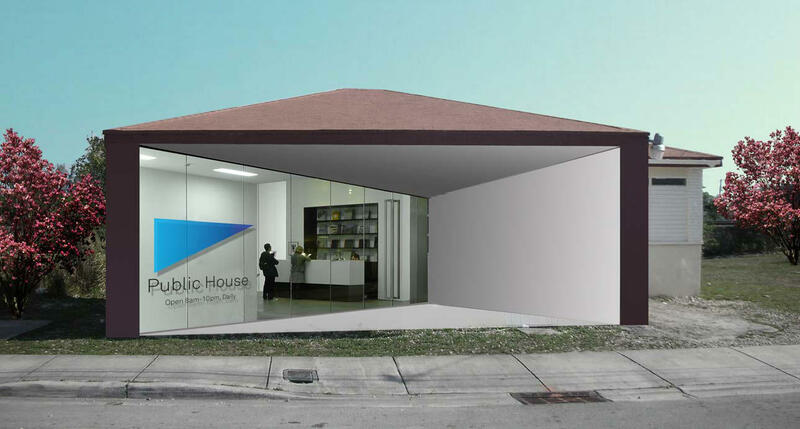 The developers in Wynwood who were behind the area's conversion into an arts district have been criticized for displacing longtime residents of the neighborhood. But Barnes says the Opa-locka project just won't work without buy-in from the community. This is an artistic rendering of what the developers of this project are calling public houses. "It's exactly what I want to do with art and architecture, and that's impact lives and change communities via art and architecture, which is something that typically people say you cannot do,"said Barnes. "One is called the public houses, not to be confused with public housing," said Barnes. "In this sense we're taking an existing typology within the neighborhood, which is the pitched roof, and taking these multi-family homes and converting them into public amenities. For example, one quadplex is being converted into an art gallery." The second phase is what Barnes calls the micro-enterprise program. He says it's a way to give the people in the neighborhood an ownership stake in the project. Small business owners will be given a dedicated space attached to their homes that will allow them to work from where they live. Barnes says the 5,200 square-foot additions will be larger and taller than the homes in an effort to make these businesses stand out when potential patrons are driving through the neighborhood. He describes them as rectangular-shaped structures attached to single-family homes. "That box would have a storefront on it, so that you can sell your goods," said Barnes. He envisions these additions appealing to bakers, barbers and similar small business owners. Before The Triangle became Magnolia North, the area was seen as one of South Florida's biggest drug havens, but that's already starting to change. The Community Development Corporation has built new, updated housing in the area, which is starting to change the look of the neighborhood. Those homes will be available for rent to residents interested in the micro-enterprise project. While he's working in Opa-locka, Barnes is calling Magnolia North home. "By me living there, I'm able to walk around the neighborhood," said Barnes. "People can learn my face. People can see what we're doing. People will start to know who I am. So when it's time to start doing more things, not only are they more responsive to it, but they also feel more comfortable with having it in their neighborhood because they've met the person who's helping to facilitate the whole process." Barnes says the response has been positive so far. "I find more people who are excited about it than those who are skeptical of the project," said Barnes. "Typically, because the people in the neighborhood seem to feel forgotten in a sense, because of the reputation of the neighborhood, nobody wants to visit. It's a desert town. People tend to leave. A lot of the families aren't still there, so they want any kind of help that they can get." He stresses that this project won't work without community support. "If we don't find the people who live in the area who want to have their own business, who have the entrepreneurial spirit, then the micro-enterprise program becomes that much more difficult to maintain," said Barnes. "But we've gotten good feedback. We've gotten the people who want those businesses, who have entrepreneurial aspirations and are ready to move forward." Barnes points to that being another difference between this initiative and what happened in Wynwood. "So not only do we differentiate ourselves because we're not trying to exclude people, but also because the people we are including are the people who call Magnolia North home." This project is still in the early stages. Barnes and his team are trying to decide on the right color scheme for the micro-enterprises while allowing enough latitude so that no home addition will look like another. Barnes says he knows the area won't change over night, and it will be well into the future before he knows if his dreams for Magnolia North have been realized. But if he visits the area in 10 or 15 years and the structures he builds are still being maintained, the residents are still benefiting and the population is still growing, he says, he'll have his answer. "The largest thing is just seeing a very vibrant community, seeing people out having fun, new buildings being built," said Barnes. "For me, that's a successful project." The arts initiative is expected to be completed by 2015.